NSK’s Long-Life Spherical Roller Bearings for vibrating equipment are engineered specifically to contend with high-speeds, shock loading, misalignment, marginal lubrication and frequent vibration of equipment used in mining, aggregate, cement and construction industries. High-performance NSKHPS™ material engineering and optimised internal bearing design along with tightly controlled internal clearance and dimensional tolerances deliver increased load ratings and extended operating life under the most severe conditions common to these applications. Proper fits are imperative for optimizing the operating life of spherical roller bearings in vibrating equipment. By ensuring appropriate interference between mating surfaces, inner ring to shaft, outer ring to housing, the risk of circumferential displacement during operation is minimised and so to the possibility of premature bearing failure due to slippage of the bearing rings (creep). In order to ensure reliable bearing mounting, it is recommended to inspect fits prior to installation: measure and record shaft and housing dimensions and review the values with the recommendations For additional verification or consultation, contact NSK. Utilizing advanced material engineering and heat treatment technology, NSK’s High TF Tough Steel (HTF) design of VE series spherical roller bearings provide improved resistance to wear and seizure in contaminated lubrication conditions. 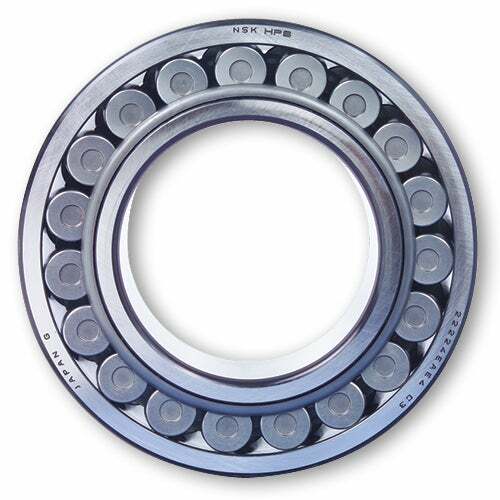 Tough Steel technology can be applied to a wide range of bearing types including spherical, cylindrical and tapered roller bearings, as well as deep groove and angular contact ball bearings as used in mining and aggregate applications subject to similarly severe service conditions. For availability and other information on High TF Tough Steel (HTF) shaker screen bearings, please contact NSK directly.